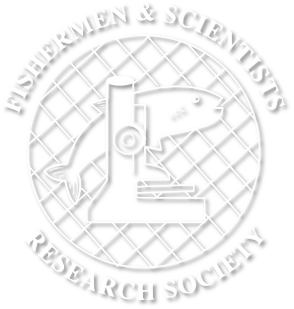 Established in January 1994, the Fishermen and Scientists Research Society (FSRS) is a non-profit organization which is an active partnership between fishermen and scientists. The FSRS was developed with the overall objectives to promote effective communication between fishermen, scientists and the general public, and to establish and maintain a network of fishermen and scientists capable of conducting collaborative research and collecting information relevant and necessary to the long-term sustainability of marine fisheries. The current membership consists of 411 members, including 260 fishermen members and 151 scientists/other members. Scientist members have come from both the government (e.g. Department of Fisheries and Oceans) and academic communities, as well as from the private sector. The early days involved many discussions in kitchens, town halls, church basements, and bait sheds to build initial bridges and trust between fishermen and scientists, to develop some common language, and to negotiate common goals. These early steps were necessary to overcome the significant mistrust that had developed between the two groups. Many fishermen felt that scientists had nothing to offer because they were not fishermen and many scientists felt that fishermen, without formal training, could not participate in scientific discussions about fish stocks. From these humble beginnings, with not much more than a willingness to talk, and a feeling that co-operation was better than confrontation, Department of Fisheries and Oceans scientists and fishermen (among others) worked towards the evolution of the FSRS. It has now developed into an effective organization which brings the knowledge of fishermen into the scientific arena by agreeing on rules of information and educates fisheries scientists by making them realize the wealth of knowledge about fishes and fishing that fishermen gain by experience. In turn, fishermen gain an increased understanding of the scientific methodologies and processes involved in managing the fisheries resource. The FSRS was formed out of the recognition by both fishermen and scientists that each had valuable contributions to make to the effective long-term stewardship of living marine resources. A partnership based on effective communication and common goals was a necessary prerequisite to realising the FSRS’s objectives. This partnership has enabled valuable joint projects that are important to the advancement of assessment and management of our fisheries resources.